Every marketer ultimate question: Which is better? Some say that inbound marketing is better since customers aren’t even paying attention to traditional “outbound” marketing. Facts that support their statements are on point: 45% of direct email messages never gets opened and 84% younger than 35 years-old leaves a website with excessive advertising. So, they praise to the heavens the “new ways” of marketing, all because it works by earning someone’s attention, rather than buying it. But let’s explain a few terms before we go into differences! Firstly, inbound marketing is a relatively well-known marketing concept in the past few years. It’s the concept where marketers attempt to “pull” in potential customers with interesting content. Inbound marketing involves creating and using a blog, social media, infographics, white papers, email newsletters, and other content that people want to read. People interact with content, read and share, and come away with a positive impression of the brand that can influence later purchasing decisions. By aligning the content, you publish with your customer’s interests, you naturally attract inbound traffic that you can then convert, close, and delight over time. Therefore, inbound marketing is a marketing approach adapted to the modern buyer. You can say that inbound marketing is designed to better align with the buyers’ journey. Outbound marketing is what used to just be known as “traditional marketing.” This concept is well-known among marketers because, before the Internet and social media, this was the most popular one. It’s interruptive and “push” itself at an audience, whether the audience like it, wants it or not. TV, radio, telemarketing, billboards, newspaper and magazine ads, etc. These are all examples of outbound marketing. Outbound marketing has fallen out of favor in the last 10 years. It fell out because of the marketers who pushed ads too far and advertisers who displayed ads too often. The same thing is in the online sphere. Outbound marketing can be used also in digital format like email, banner and display ads, PPC and spam, etc. These led to oversaturation, so people start to ignore display advertising and outbound marketing. In contrast to inbound marketing, outbound doesn’t take the buyer’s journey into consideration. 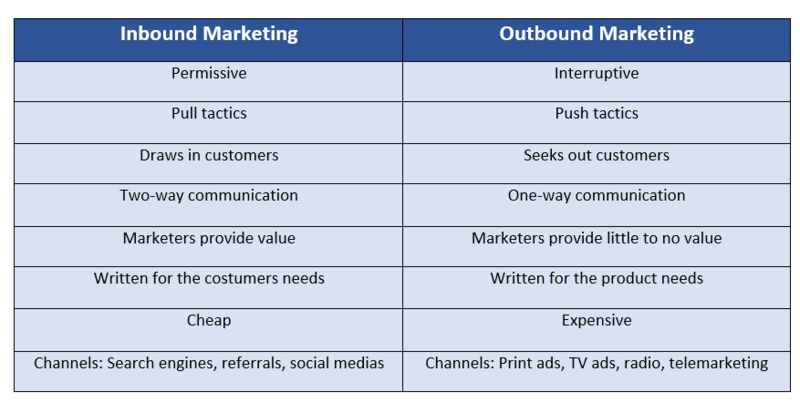 In their most basic forms, outbound marketing uses push tactics while inbound marketing uses pull tactics. Therefore, we can say that outbound marketing is interruptive, and it seeks attention from people. While inbound is permissive and it isn’t as aggressive as its counterpart. So, you can see that inbound is all about drawing people in and communicating with them. Outbound marketing seeks out customers and because of that it’s all about one-way communication, and it comes from brands, not customers. A big part of inbound marketing relies on creating valuable content and attracting visitors with it. It relies on the development of modern communications technology like the Internet, mobile phones and social media to attract consumers. Inbound and outbound marketing are two separate approaches that can be used effectively on their own or even together. Both of those types have their own unique set of advantages and drawbacks. But, most businesses find that using both types can be the most effective. The key point to bear in mind is that you should always try new things and implement them with old things that work well. Technology, audience, and rules change. Therefore, what works now, probably won’t work tomorrow.